Christmas in Austria and Germany was always my favorite time of year. Nothing beats the Christkindlmärkte (Christmas markets) and a nice steaming glass of Glühwein (mulled wine) while standing under white twinkle lights and straw ornaments. The Christmas season is officially starting today for me, with Saint Nicholas Day, which was the inspiration for the American Santa Clause. In Germany, Nikolaus is usually celebrated on a pretty small scale. Many children put a boot, called Nikolaus-Stiefel, or shoe outside the front door on the night of December 5 to December 6. St. Nicholas fills the boot with gifts, and at the same time checks up on the children to see if they were good. If they were not, they will have a tree branch (rute) in their boots instead. Sometimes, a disguised Nikolaus also visits the children at school or in their homes and asks them if they “have been good” (sometimes ostensibly checking a book for their record), handing out presents on a per-behavior basis. But for many children, Nikolaus also elicited fear, as he was often accompanied by Knecht Ruprecht, who would threaten to beat, or sometimes actually eat, the children for misbehaving. Knecht Ruprecht is a scary looking incubus with goat legs. In Switzerland, where he is called Schmutzli, he would threaten to put bad children in a sack and take them back to the dark forest. In other accounts he would throw the sack into the river, drowning the naughty children. These traditions were implemented more rigidly in Catholic countries and regions such as Austria or Bavaria. 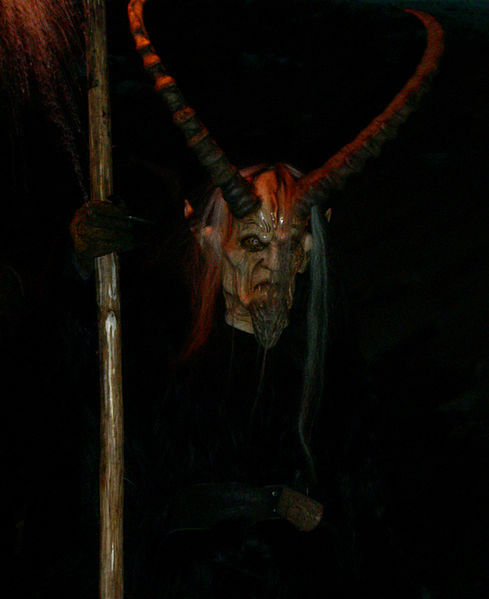 In parts of Austria, Krampusse, who local tradition says are Nikolaus’ helpers (in reality, typically children of poor families), roamed the streets during the festival. They wore masks and dragged chains behind them, even occasionally hurling them towards children in their way. These Krampusläufe (Krampus runs) still exist, although perhaps less violent than in the past. The word Krampus originates from the Old High German word for claw (Krampen). Traditionally in Austria young men dress up as Krampus in the first two weeks of December, particularly in the evening of December 5, and roam the streets frightening children (and adults) with rusty chains and bells. In some rural areas the tradition also includes slight birching by the Krampus, especially of young females. I for one hated walking on the streets of Salzburg during this time, because it was an excuse for delinquents to beat people. Some of us wore long coats to ward off the hits. Basically you heard the bells and ran like hell. I think the “Rute” that kids get is more in the sense of a switch or a birch, and is a symbol for getting a beating if I understand correctly. People also say “Du kriegst die Rute” which has the symbolic meaning of getting the branch and no candy but also getting hit with a stick. Ah, what a wonderful tradition. Chuck loves the Dutch story best where children are told that St. Nikolaus will take them away from their parents if they were bad. Otherwise, thanks a lot for the reminder! I always loved the tradition of getting candy in my boot. I usually had my little blue and yellow rubber boots in front of the door and how much fun it was to open the door in the morning and there was candy. Probably similar to Seinfeld’s fascination with Halloween where strangers just give you candy.